The first stone chapel on this site was probably built about the middle of the 12th century. Parts of the present west wall of the nave may be from this building. Rebuilding took place early in the 14th century, from which date parts of the nave roof survive. 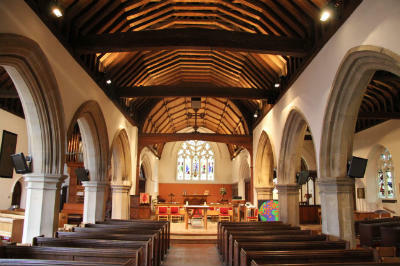 By the end of the century the church consisted of nave, chancel and west tower, the south aisle being added in the 15th century, with an unusual roof construction. This aisle is built mainly of carstone, the tower of flint, clunch and heathstone. Towards the end of the 18th century the chancel was rebuilt in brick. Extensive restoration took place in the 19th century, the "handsome Gothic screen" being removed in 1840, the brick chancel replaced and the nave and south aisle extended eastwards in 1890. In 1909 the north aisle and vestries were added, the Holy Trinity Chapel in 1910 and the baptistery in 1921. All these later extensions are built in Bargate stone. The church is entered from the tower through the Medieval doors, still in place. They are of oak and retain original hinges, latches and ironwork. In the clergy vestry are a number of photographs and sketches. One dated 1814 depicts the font removed in 1829, which was possibly of late Norman date. On the outside wall of the baptistery are the remains of two windows removed from the north wall in 1909 when the aisle was built. The larger dates from c1320, while the smaller square-headed window is of the mid 15th century. One other early 14th century Decorated window still remains, although much restored, and is of identical size and style. It was removed from the original south wall of the nave to its present position east of the south door. To the west of this door is a Perpendicular window with a hood mould, again heavily restored. The east window dates from the restoration of 1890, and the stained glass from 1893, dedicated to Rev J Back, vicar 1878-1884. "Item. to Harrysonn the Joyner for mending the Pewes in the churche & Chauncell & for his Puylpytt xxiiij s viij d.
Item. for the Puylpytt post xij d.
Item. for fetchinge the post, the puylpyt & makinge cleane the church xij d."
In the south wall of the south aisle are the remains of a piscine with a trefoil head, indicating that a pre-Reformation altar stood nearby. This piscina blocked up for many years was rediscovered in 1890. It has lost its projecting basin. A most unusual item in the church is the iron spit 3 ½ metres long. There were originally two of these, as recorded in an inventory of 1552, as "brochis": "Item. I caudraon ii iron brochis…". They were probably used for roasting an ox or pig at a parish festival. The brass chandelier hanging in the chancel is undated and has no inscription, but was probably made c1730. 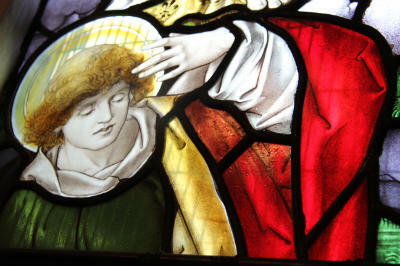 It was purchased from St Mary's church, Guildford, in 1863 and brought to Horsell. In the porch and north aisle are oak chests. The earlier one, of 15th century date, is at the end of the north aisle. The chest in the porch is of 16th century. Two of the original locks and keys still exist. The earliest brass is an inscription on the floor near the lectern to a 15th century priest, John Alleyn. Later brasses all dated 1603 to members of the Sutton family are now on the north aisle wall. Each inscription ends with the request "Gentle reader deface not this stone". The latest brass memorial is on the floor at the foot of th e chancel step, and is to Thomas and Ann Edmonds, dated 1619. Their children are also shown, the eldest and fourth sons each carrying a skull, to illustrate their dying during their father's lifetime. On the wall of the south aisle is a monument to James Fenn, 1793, which is of unusual design for this date. The monument on the west wall is to Sir John Rose, 1803, son-in-law of James Fenn. Also on this wall is a small oval tablet in memory of John Green, 1651.